Nasalot is a victim of poachers, her mother having been killed and found dead with tusks removed near Nasalot in Turkanaland. 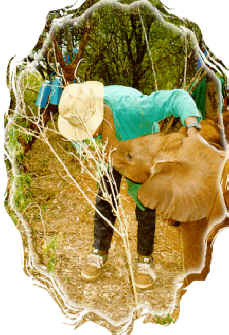 She was 2 – 3 months old when orphaned and therefore born approximately January 2000. There are only very few surviving elephants left in the harsh lava deserts of Turkanaland, where the odds for survival are heavily weighted against all living forms, even the humans. The long arm of the law does not touch this harsh and forgotten wasteland constantly beset by drought, and the few surviving elephants have been hardened through natural selection. Due to poaching pressure, those few have become nocturnal, feeding at night, and either on the run or hidden in thorn thickets during daylight hours. When little Nasalot came into the Nursery in March 2000, we had great difficulty reversing this sleeping pattern, for she wanted to sleep during the hours of daylight, and was extremely restless all night, pacing around the stable, and refusing to settle. This was exacerbated by deep grieving for her lost family, being about two months old when orphaned – a difficult age, because she remembered her elephant family clearly. Psychological trauma, depression and lack of sleep took a heavy toll, and she rapidly lost what little condition she came with on arrival, and becoming very weak and skeletal. We had difficulty stabilizing the diarrheoa and persuading her to make the effort to live, but the other elephants helped her turn the corner at last, and today she is plump, playful and happy – a very endearing little elephant in every way, and, like Ajok, the product of a very tough population of desert elephants.